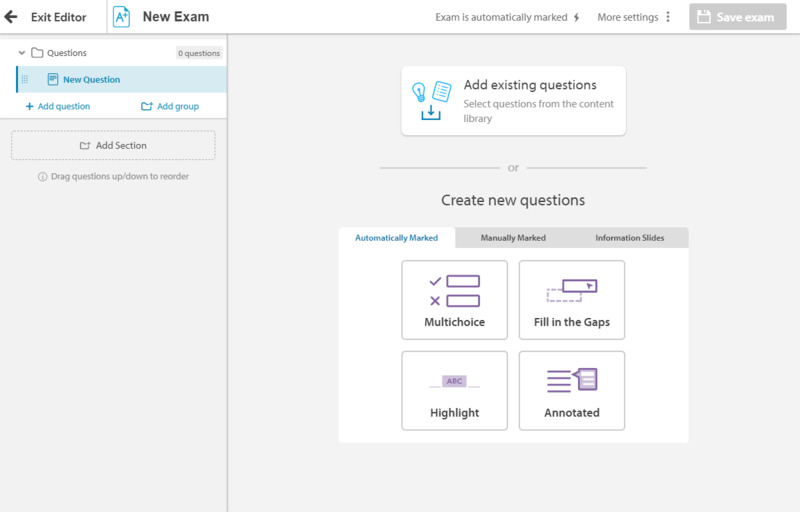 With our assessment builder, you can create your own custom tests to run online. This enables you to better streamline the marking process and even gives you the option to automatically mark work where suitable. 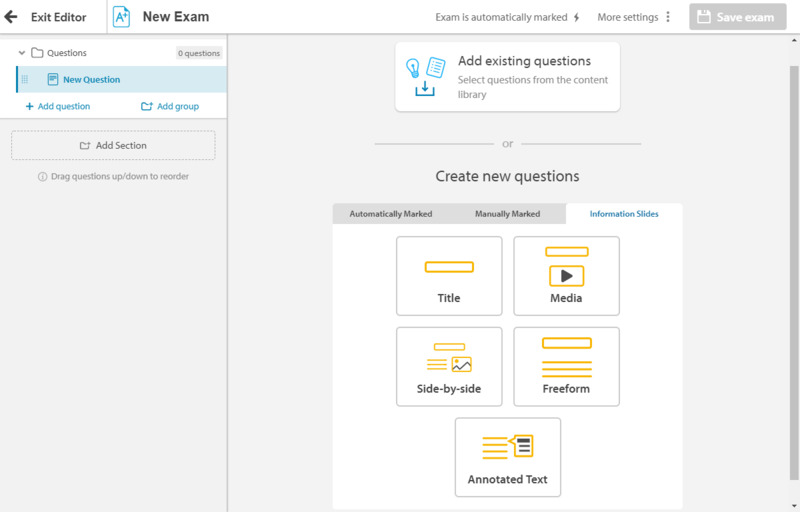 Get started on creating an assessment by heading to your Content Library and ensuring you're in Edit mode. 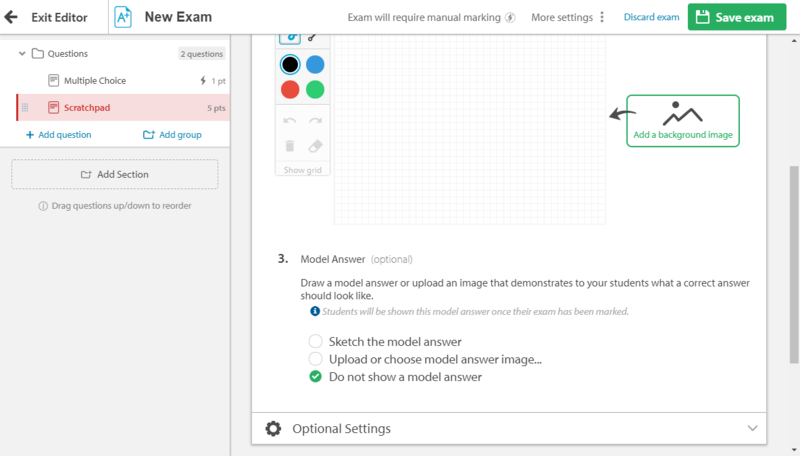 Choose Create an activity, then select Exam from the drop-down menu that appears. 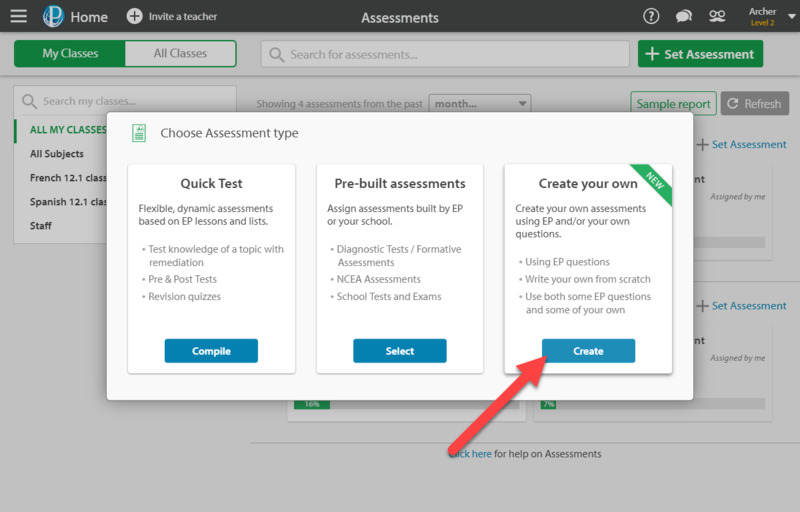 Assessments can also be created in the Assessments feature by clicking Set Assessment and then Create on the Create your own tile. The work you do will be saved in the Private Workspace section of your Content Library. 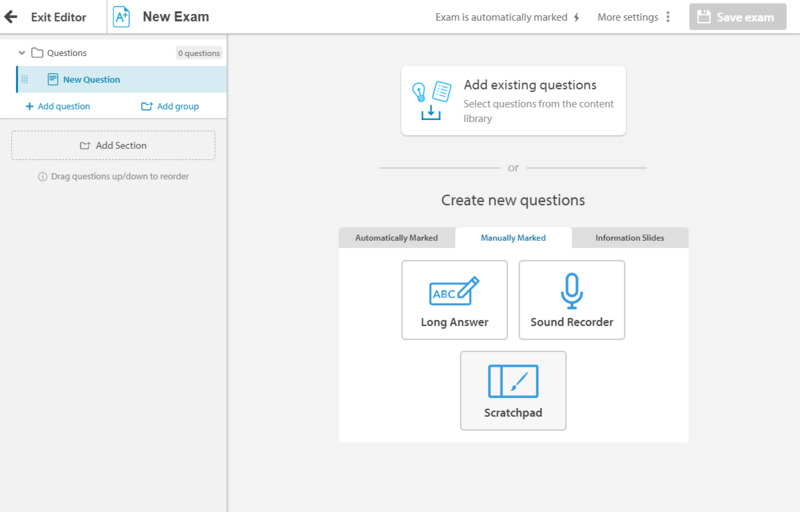 Automatically marked questions are marked by the system as soon as an assessment has been completed. When setting questions up, there's an option at the bottom of the page to set them to be manually marked. You can also manually override these marks once the assessment has been completed. 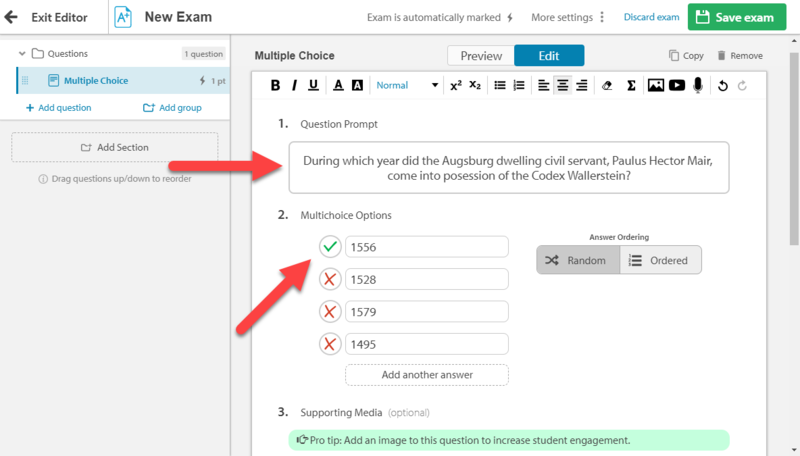 For exams made up of solely automatically marked questions, you can choose whether or not to release the results to students immediately. Begin by posing the question you wish to have answered in the Question Prompt field. Then, add at least two possible answers in the spaces below. Make sure the correct answer is within the field with the green tick beside it. 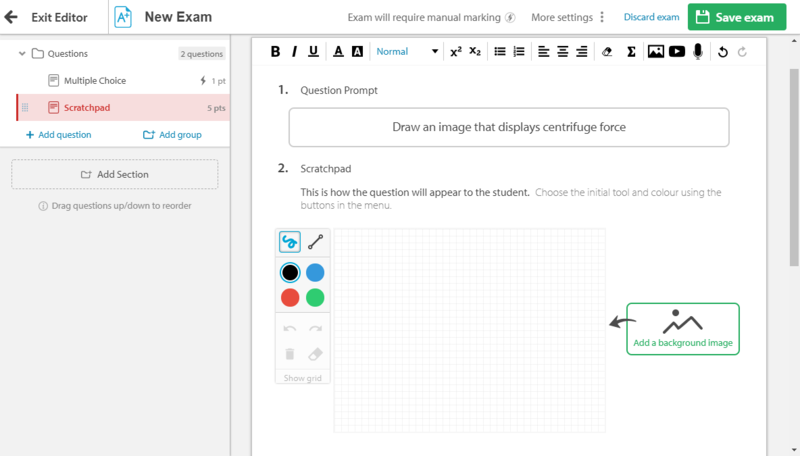 Using the Answer Ordering options, you can choose between fixing the order of the answers and randomising the answers each time the question is attempted by a student. Start by writing out the passage of text in full. Then, select Choose gaps and click on the words which you wish to be omitted. These will show up as yellow, and will be listed in purple underneath the text-box. Add distractors to make the question more challenging by selecting the Add distractors button. These distractors will show up as options alongside the correct answers when your students are completing the assessment. Highlighting questions require your students to highlight part(s) of a sentence or paragraph to answer the question. First, you'll need to write the question in the Question Prompt section and a sentence or paragraph for your students to highlight in the Text to Highlight section. Next, you have the option of selecting what students will need to highlight in the drop-down menu: words, sentences, or paragraphs. Once you've done that, you'll need to click the Choose Highlights button. Click on the relevant words to highlight them — these will be the answers that your students need to select. Annotated questions require your students to answer questions based on specific part(s) of a sentence or paragraph. First, you'll need to write the question in the Question Prompt section and a sentence or paragraph for your students to answer questions from. Once you've done that, you'll need to click the Choose Highlights button. Click on the relevant words to highlight them — these will be the answers that your students need to select. Manually marked questions generally require you to mark any answers that students submit against a marking schedule and/or an example answer. Scratchpad questions allow students to draw their answer rather than typing it out. This can be useful for science based questions like those that ask for a practical example of a particular formula or for calligraphy based language questions. If you wish, you can insert an image for your students to draw on top of from our image library or you can upload your own. Alternatively, you can provide them with a model answer that will appear along-side the scratch pad, which can be either an uploaded image or one you draw yourself. 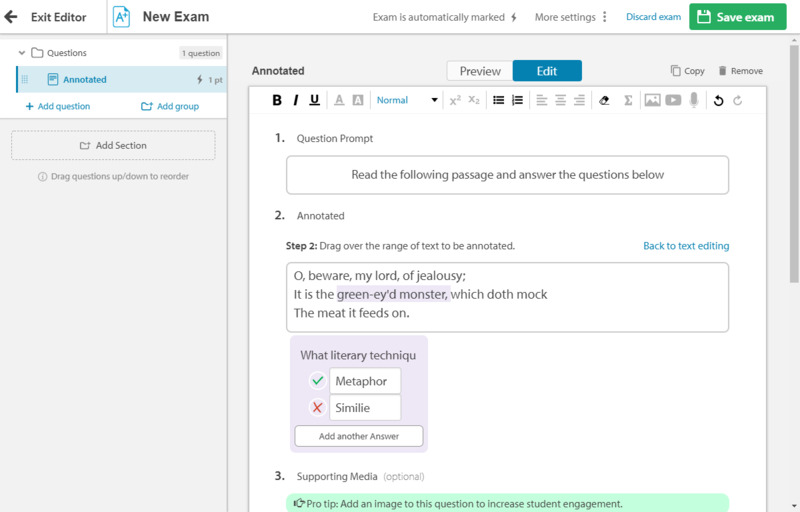 Long answer questions can be used for exams that require extended student responses, such as text analysis and micro-essays. Students are not restricted in what they can write and will have access to basic formatting tools. 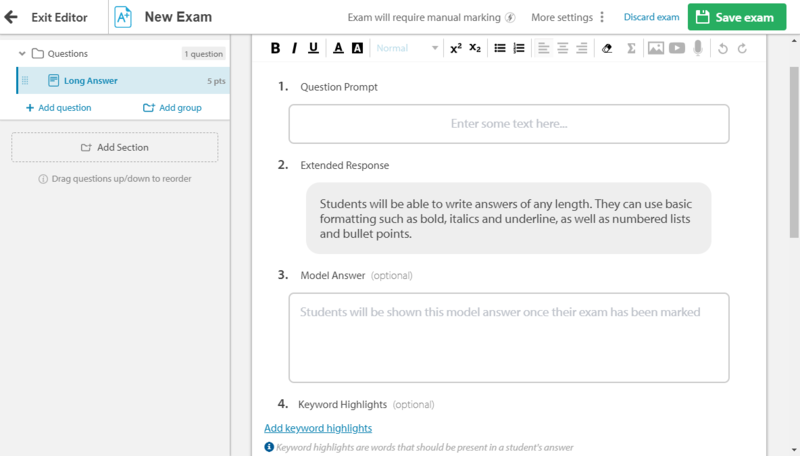 You can provide students with a Model Answer which will become visible to them upon completion of the exam. This can be used to allow your students to compare their answer to yours and see what they may have missed. 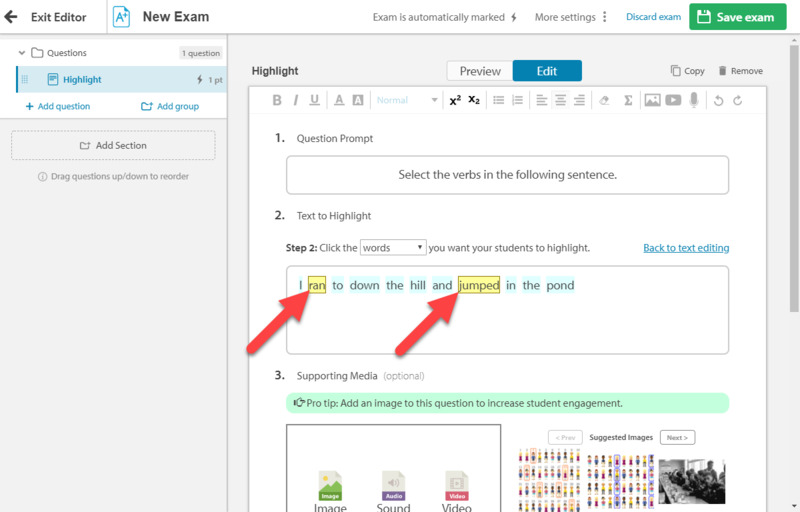 The Keyword Highlights option helps save you time while marking by highlighting key words in your students responses when they're entered. You can also create synonyms of each word, meaning that the system will view everything in each category as being correct. The sound recorder can be used to require your students to provide a verbal answer. This can be used in language exams to display knowledge of their chosen topic, or can be used to record oral presentations through the Extended Recording function. You can pose your question to students in either a written or verbal format. Please ensure that your students have enabled microphone access on their devices before using these questions. If you encounter any trouble with microphone access, please click here to view our troubleshooting page, or contact support@educationperfect.com. 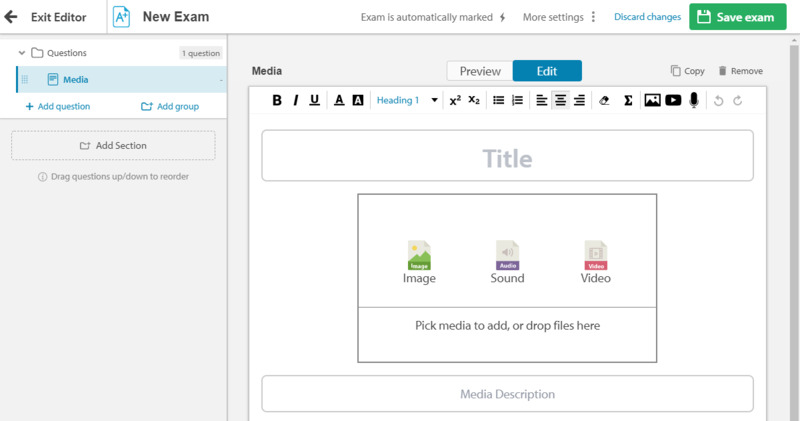 Information Slides are designed to allow teachers to add additional media for exams. This might be something like a passage of reading for students to answer questions on or a video for them to watch and respond to. There are various slide templates to choose from. 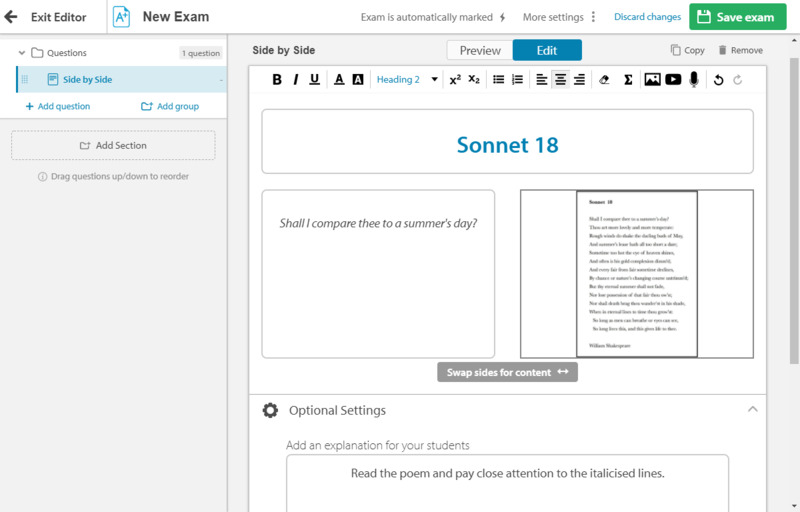 Title slides allow you to add section headers which are particularly useful if you're splitting assessments into separate sections. The media slide template allows you to dedicate pages in the assessment to an image, an audio file, or a video. You can select content from the content from within our library or upload your own. With the side-by-side template, you can neatly organise a page that has both media and a paragraph of text. The free form template allows you the freedom of arranging content however you want it. You can include, video, audio, and text that you can freely arrange. 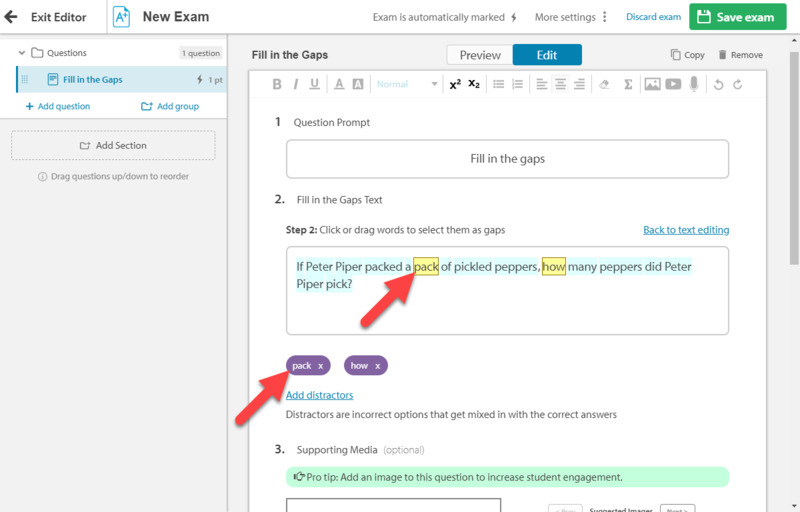 Annotated Text questions allow you to annotate passages of text for your students to answer questions on. To visit our article dedicated to Media in tasks and assessments, check out How do I add media to my question? Most slides allow you the freedom of choosing from different layouts and adding additional descriptions to them. There are also some very useful marking settings that you can set. As well as switching between Automatic and Manual marking, you can select how many points question is worth — simply type the number of points in the Score field at the bottom of the page. Analysis tags are primarily for breaking down assessment reporting into categories, but they can also be used in diagnostic testing to automatically assign remedial work based on how students perform on a given set of questions. To add tags, simply click the Add tag button at the bottom of the page and type in a keyword. 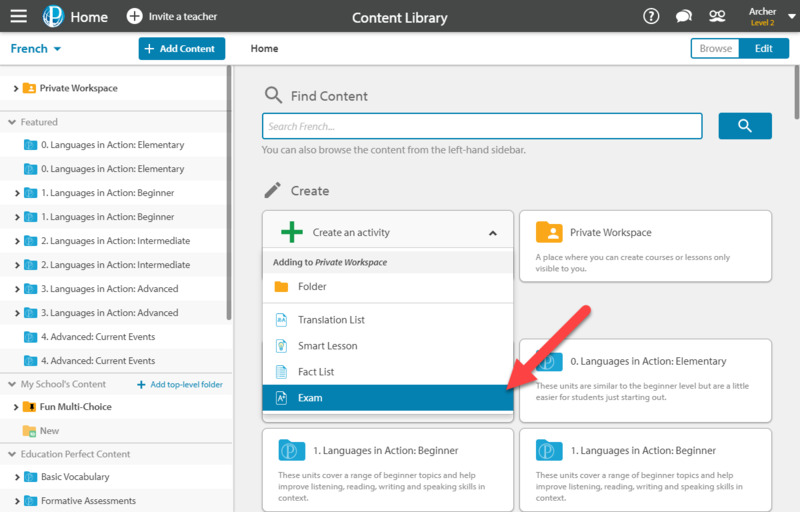 You'll be able to select Add content to add lessons that'll end up being assigned. Once an assessment has been completed, your answers will be categorised by the analysis tags that you've given each question. It's critical that you add any analysis tags before your students sit the assessment. Otherwise, you won't be able to view the answers by analysis tag category. You can add tags to a question to link remedial work to it. 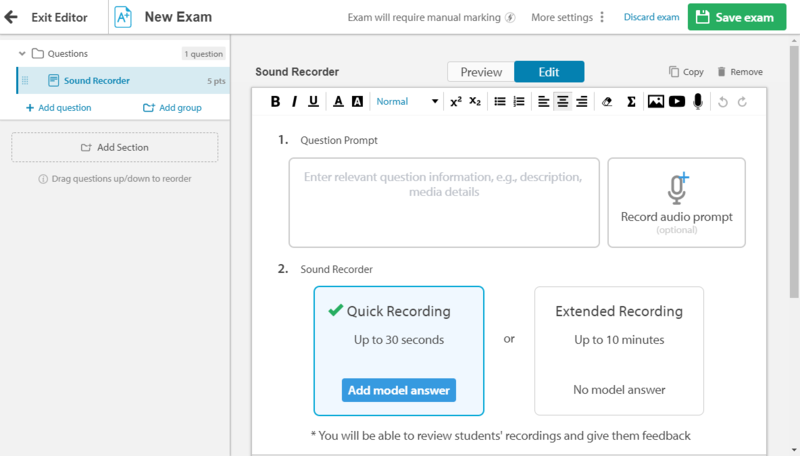 This allows you to automatically set work for students to work on if they have trouble with certain topics within the assessment. You can arrange questions into sections. This is intended to make things easier for you to organise when marking and won't affect the way in which questions appear when your students are sitting an assessment. You can do this from the sidebar on the left side of the page.